After sending back the uneaten and thoroughly abysmal cheeseburger at Postrio, Happy Meal and I were in need of sustenance. He got excited that Gordon Ramsay had a burger restaurant in Las Vegas. At our place, we refer to Gordon Ramsay shows like Hell's Kitchen as "cooking and yelling." We put our names on the list, and took a walk to kill time during the 45-minute wait for a table. Our server, Lexie, was attentive and most knowledgeable about the food and the preparation. We ordered a couple of the $13 American Burgers from the11 burger menu and settled in for another 40+-minute wait. BurGR was packed, and the kitchen was not slacking. Happy Meal and did glorious thumb war battle. Later, I checked the underside of our table for gum....only one piece...pretty good for Las Vegas. 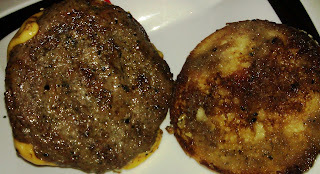 The Beef: BurGR made the patties from a blend of 50% Chuck, 25% Short Rib, and 25% Brisket. This was one of the golden ratios for burger preparation. The beef was completely delicious. There were strong notes of beef and complex mineral notes. The Brisket lent a steak-like texture to the bite. There was no funk from aging. The beef was juicy. Like The Brindle Room in NYC, BurGR incorporated deckle fat into the blend. This amped up the fat content before cooking. That additional fat melted off during the cooking process. This left the burger in the non-heart stopping, 20% fat, range once it was prepared. The deckle imparted a creamy lushness to the burger. The resulting mouth feel was smooth and luxuriant. The lushness was never interrupted by any connective tissue. This showed that great care was being taken throughout the process in terms of quality...more on that later. The Seasoning: There was a light dash of something savory on the exterior of my burger patty. This was one of those cases where a strong dose of salt and pepper would have created a distraction from the show-stopping beef. The Sear: There was no sear to speak of. I assumed that the point of the burger was to deliver a smooth, easy bite. I would have preferred a hearty sear on the high-quality beef, but this version of the burger worked perfectly well. The Preparation: Like BLT, BurGR had an on-site butcher that trimmed, ground, blended, and prepped the burger meat. The butcher staff was clearly skilled and incredibly meticulous in the trimming of the beef so that there was no trace of chewy sinew in the cheeseburgers. The 7-ounce patties were loosely formed on a daily basis and delivered up to the bustling BurGR. My burger was grilled to a juicy Med-Rare, as requested. I never got a look at Happy Meal's Medium burger, because he inhaled his burger before I got to my second bite. Happy Meal strongly approved of his cheeseburger. The Cheese: The American Burger came with American cheese. The cheese completed the picture with salt, iron, and additional creaminess. The cheese was perfectly melted. 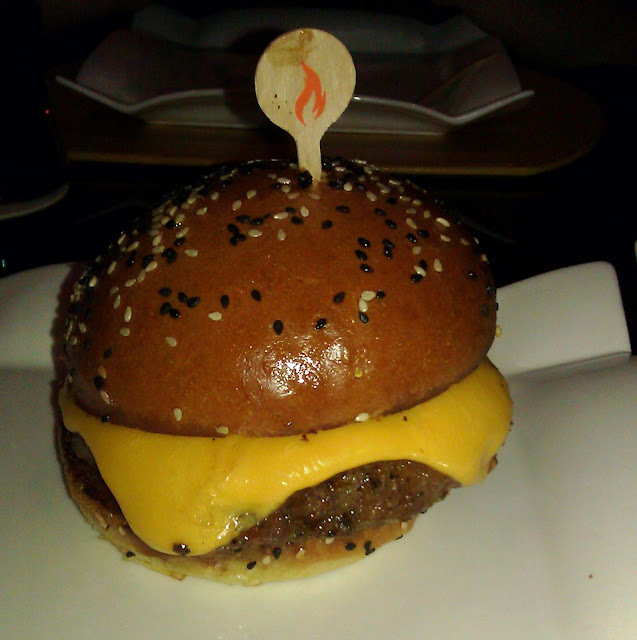 The Bun: BurGR utilized the in-house bakery at the Paris Hotel and Casino. The bun was a pillowy, light, soft, fresh, buttery, yeasty, and heavily seeded brioche. The seeds on the bun provided some crunch. That texture was welcome. The brioche was not thoroughly toasted. However, the juicy beef would have soaked right through a seared bottom bun. The Meat To Bun Ratio: BurGR got the portion sizes just right. The bun was competent but not overwhelming. The Toppings: The tomato slices were perfectly ripe, and the Bibb lettuce was fresh and sweet. The fries came with a couple of house-made ketchups that were spectacular. The chipotle and curry ketchups didn't flirt with their namesake spices--they embraced and showcased them. This was refreshing. The standard ketchup was also prepared in-house. It was rich, hearty, and not overly green tasting, which is a flaw in many recipes. The Fries: The fries at BurGR were thick and cut in house. These were peel-on, canola oil-fried, and properly seasoned. 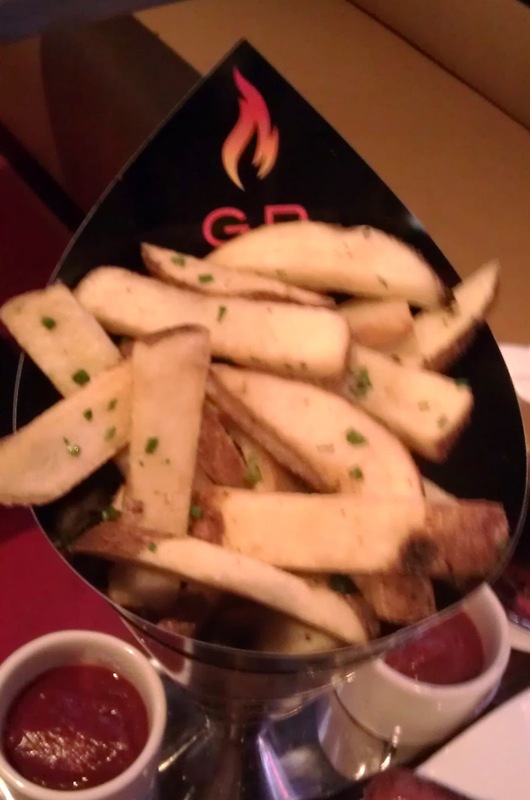 The fries were crisp on the outside and creamy in the center. The wide fries made it easy to scoop up more of those delicious ketchups. 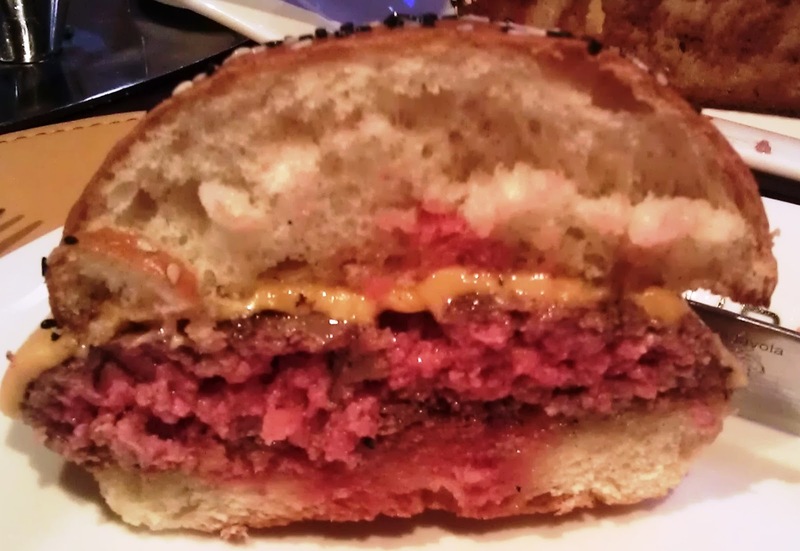 The Value: $13 for 7-ounce burger made sense--the burger was perfectly prepared from really fantastic ingredients. The quality of the food and service was stellar. Like the nearby BLT, the eponymous BurGR was an example of a celebrity chef restaurant that truly delivered more than a brand. BurGR delivered exceptional burgers at a fair price. Burger Review : BurGR served up a nearly perfect cheeseburger at a fine value. I'm surprised you didn't round it up from 4.5...this "nearly" perfect, non-seared burger. Your review was technically positive yet lacked the verve one would expect from a rare 5 Bite review. My $40 Gordon Ramsay Burger fries and Iced Tea was easily the worst ever. It was raw and I waited almost an hour for it. My $40 Gordon Ramsay Burger fries and Iced Tea was easily the worst ever. It was raw and I waited almost an hour for it. The fries were good at the top but brown and gnarly inside. Oof--I hate it when that happens, and it happens a lot. Did you send it back? Nope. I couldn't see waiting another 40 vacation minutes. Plus I didn't trust what would come back in its place. where is fat bruce lee at? Went with a friend.Had a burger (nice but nothing special), truffled fries, cheese jalapenos and tap water. Something made us both very sick as we started having bad stomach cramps, nausea and bloating almost straight after leaving the restaurant. The symptoms persisted for several days after. I don't know whether it was food or lack of hygiene related. Of course we rang the restaurant straight away. They made us write a report and passed it to CCMSI (an insurance company) which did NOTHING for us rather than repeating that they carried out an investigation but no findings (although they refused to disclose the details of the investigation). We then tried to contact the restaurant to address our concerns but to this day the restaurant refuses to get in touch with us insisting that it's CCMSI's issue now. That's how they "wash their hands". They didn't even offer to refund our meal. It was supposed to be a treat but...as it turned out.... we paid a lot of money...just to get sick!